Multi-strain probiotic and lactic ferment complex (5 strains). Each capsule contains 15 billion active cells, concentration guaranteed until expiry date. Maltodextrine, capsules végétales (hypromellose), inuline (prébiotique), stéarate de magnésium, dioxyde de titane, acide ascorbique. Adolescents 12 years old and over and Adults: Take one capsule twice a day at breakfast and dinner. Antibiotic use is more and more common, regardless of age. Antibiotic therapy destroys not only the bad bacteria, but also the good ones, causing intestinal disorders commonly referred to as 'antibiotic-associated diarrhea'. The result; an unbalanced intestinal flora. 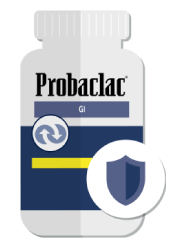 Probaclac GI is a formula specifically designed for antibiotics use, the multi-strain formula contains the Lactobacillus rhamnosus GG strain which is one of the most studied and documented strains around the world. 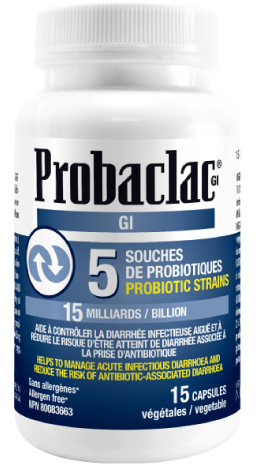 With a concentration of 15 billion bacteria per capsule, 3 strains of Lactobacillus and 2 strains of Bifidobacteria, Probaclac GI will be your best ally during your next antibiotic therapy. Antibiotic therapy leads to an unbalanced intestinal flora. Repopulate your flora thanks to Probaclac GI. How to take Probaclac GI ? Take one capsule twice a day, 2 hours after taking the antibiotic throughout the treatment and continue 3-5 days after the end of the antibiotic treatment. Probaclac GI is specifically designed to reduce the risk of diarrhea associated with antibiotic use and help control acute infectious diarrhea. One of the strains in Probaclac GI is the Lactobacillus rhamnosus GG strain which is one of the most studied strains in the world, most of the studies on this strain are on antibiotic-associated diarrhea. Why should we take probiotics during antibiotic therapy ?